I am delighted to once again play along with From the Heart Community Digital Stamp of the Month Challenge for June. 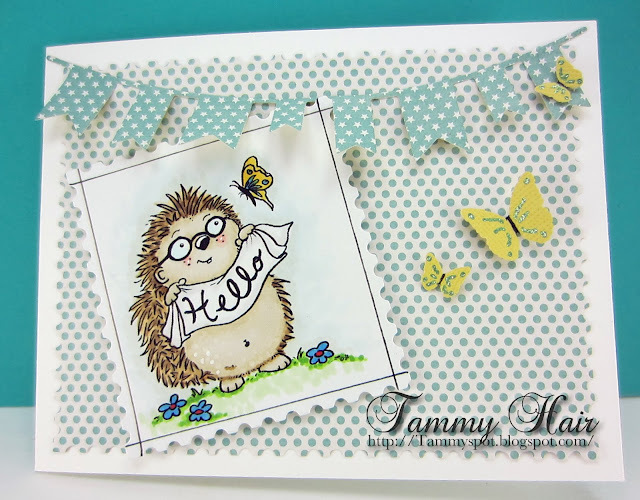 This month we received Prickles Says Hello, a real sweet set that also includes other sentiments. All the details as to how you can play along are posted on their blog. Gorgeous card Tammy, adorable image. I love the bunting and matching butterflies too. Great card and I love Prickles! Pickles is as cute as can be! Love the banner and all the fun butterflies. PRECIOUS! Sweet little hedgehog & I love the butterflies too! Cute & fun little card! He's a little cutie with his glasses Tammy and love the bunting and butterflies..really cute. What a gorgeous card Tammy, I like the image and the design. Adorable , Tammy. Like the soft colors- your coloring is great and i like the extra butterflies. Thanks for joining our FREE Stamp of the Month June Challenge @ From the Heart Stamps !! Super cute. I like the little butterflies and the hedgehog is adorable. So very cute with your banners and butterflies, Tammy! Hello, Prickles! He's so cute and I love your sweet, soft colors. Cute banner, too! Their challenges are such a great opportunity to use some of their images. I have purchased a few from them. Lots of cute stuff there! This guy is so CUTE! :) I love how you've colored him in and your banner at the top! ADORABLE!!!! Thanks for joining us for our SOTM Challenge @ From The Heart Stamps!